Recently I was given the opportunity to check out a new product from Go7Gaming. 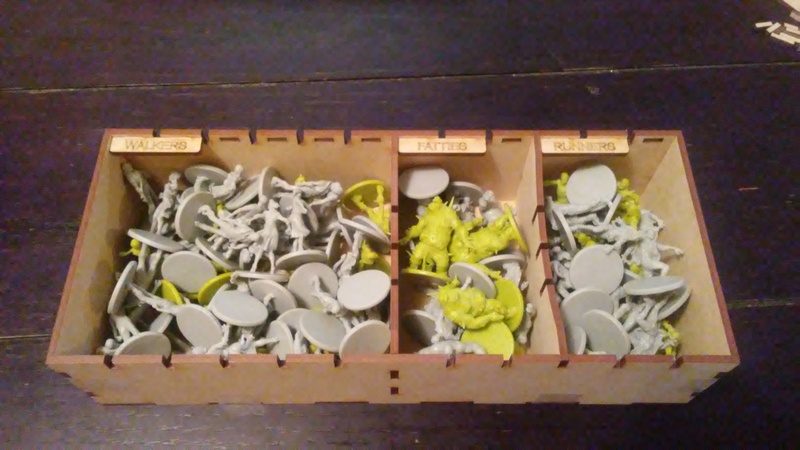 That product was the Zomb-Base-001 Storage Insert Kit for Zombicide or Zombicide Rue Morgue. I received it in a flat rate shipping box. Inside I found a bundle of wooden sheets wrapped together in a large ziplock bag with some full color instructions explaining how to put everything together. After removing the sheets from the packaging and reading through the instructions, it was ready to assemble. Now then, let me explain exactly what this product is and what it does. First off, this is an insert for the game Zombicide but it will also work with Zombicide Rue Morgue. 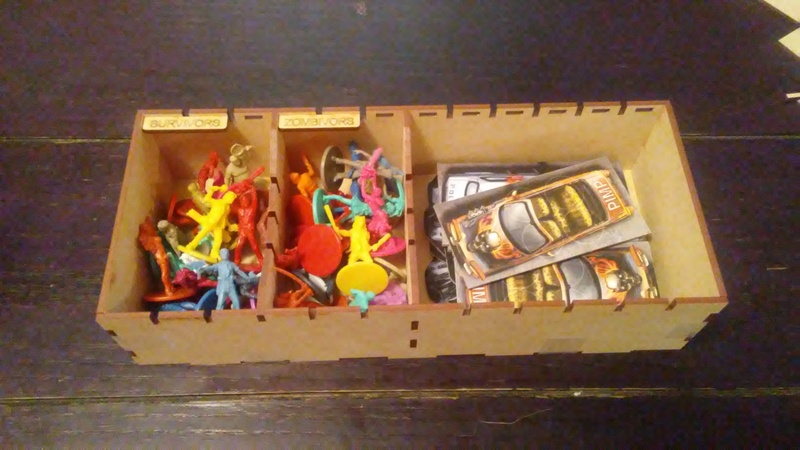 Once it’s been assembled, the insert makes it possible to keep all of the different survior, zombivor and zombie miniatures separated, as well as all of the cards and tokens that come with the game. There’s even room for individual survivors and other extras that you can purchase separately. For me, I’ve added the Toxic City Mall expansion, some extra survivors and zombivors and a few extra zombies. The insert looks really great when it’s finished. It even comes with some tags so that you can label each section for what’s inside. Of course you’ll be able to see a bit more about that a little later. At this time, let’s go ahead and cover what all you get and the basic instruction on how to assemble this insert. We’ll start off by separating out all the different wooden sheets. As you can see, there’s a lot of sheets of wood to be assembled. Each piece is cut so that you can easily punch them out from the main sheet that they’re attached to. If you’ve ever read one of my reviews for Go7Gaming inserts, you’ll already know that glue is your best friend when building these things. It’s not an absolute necessity as you can use other things like tape, but it’s definitely the best option. With this review I won’t be telling you each time when to add glue to your pieces. Just be aware that if there are 2 pieces being put together, you’ll want to apply glue between them both. 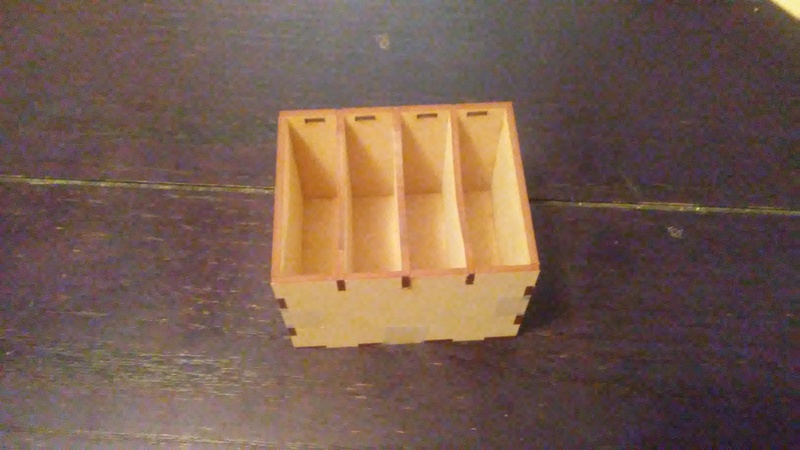 With that said, let’s begin the assembling process starting with the tile and miniatures storage tray. 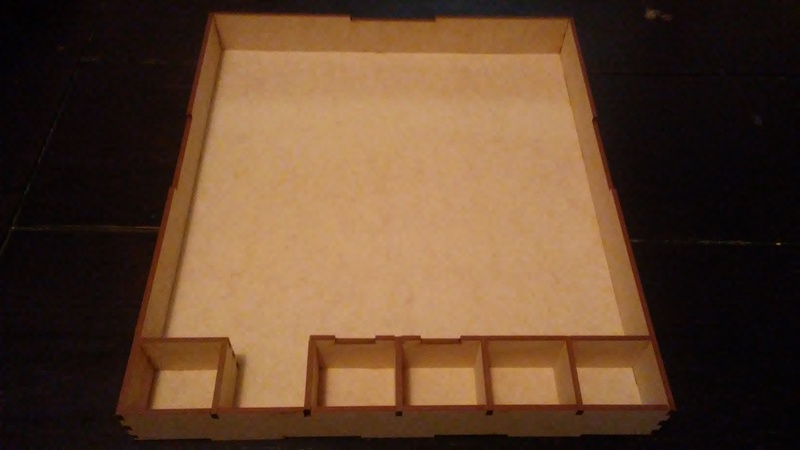 To build the tile and miniatures storage tray, you’ll start by placing the large inner lane divider into the base, followed by the small inner lane divider. Next you’ll connect the two tab end of end splitters to the base. One will also connect to the large inner lane divider and the other one will connect to the small inner lane divider. You’ll then need to attach the two long outer walls to the inner lane dividers on either side. After those are on, you’ll place the short wall onto the base connecting it to the two long outer walls you just attached. Next place the short minis wall onto the base connecting it to the long outer walls. You’ll then place all your dividers in whatever way you see fit. I went with the traditional layout. When you’re finished, it should look something like this. 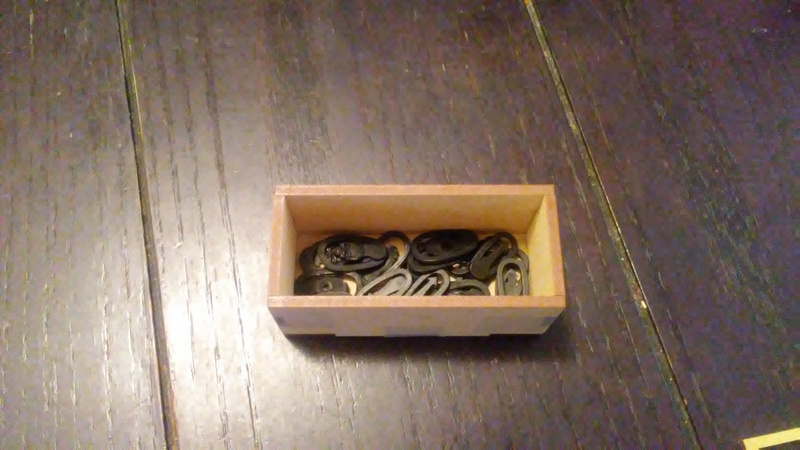 Next up, well construct the token storage tray. First we’ll connect the center divider to the base. Next attach the long wall to the base and the center divider, repeating the process for the other long wall. You’ll then want to attach the two end walls on either side. Once you’ve gotten that finished, you can add dividers as needed. Once again, I went with the traditional layout. When you’re finished, it should look something like this. 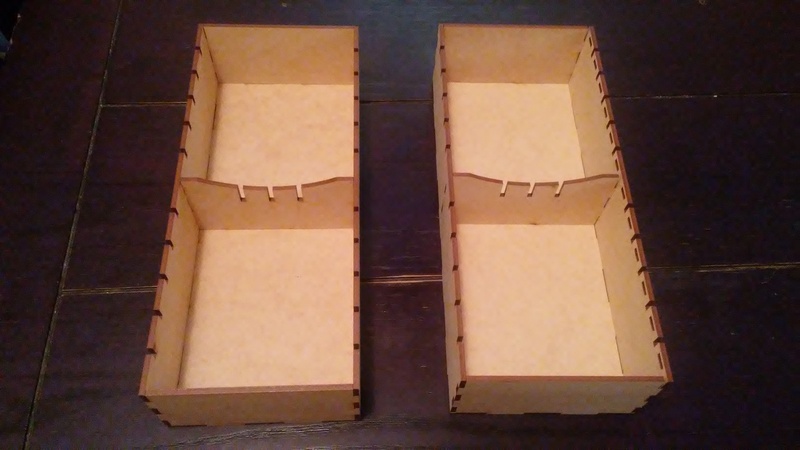 The next thing we’ll assemble is the 2 large miniatures storage trays. First off we’ll connect the center divider to the base. Next we’ll attach the long wall without the tag holes to the base and divider. We will then need to attach the long wall with the tag holes for the other side. We then will need to attach the two end walls, connecting them to the base and the long walls. Once you’re finished, you can assemble the second of these in the exact same way. Afterwards you can place dividers as needed, you can even place a cross divider to split the sections into smaller spaces if desired. I left them open to begin with and didn’t add any dividers until I figured out what I wanted to place in each space. You’ll see more on that in a bit. When you’re finished with these, you should have something that looks kind of like this. Now we’ll construct the small bit tray. To assemble it you’ll need to attach the long wall to the base, followed by connecting the short wall. You’ll then attach the other long wall followed by the other short wall. When you’re finished, it should look something like this. 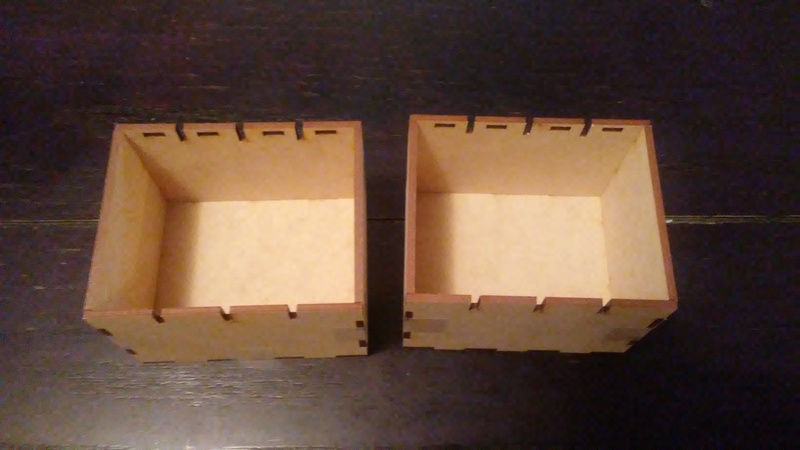 Our next project is the two small storage trays. Attach the long side wall to the base, followed by the end wall. 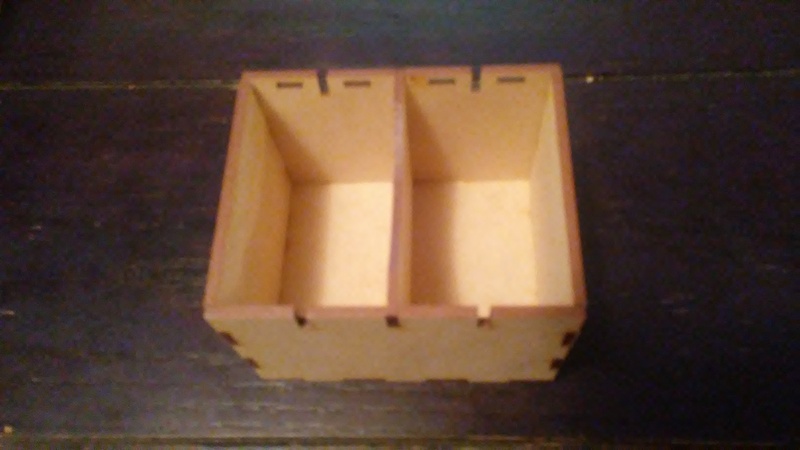 Now you’ll attach the other long wall with the tag holes on it, connecting it to the base and the end wall. We’ll then connect the other end wall and connect everything together. 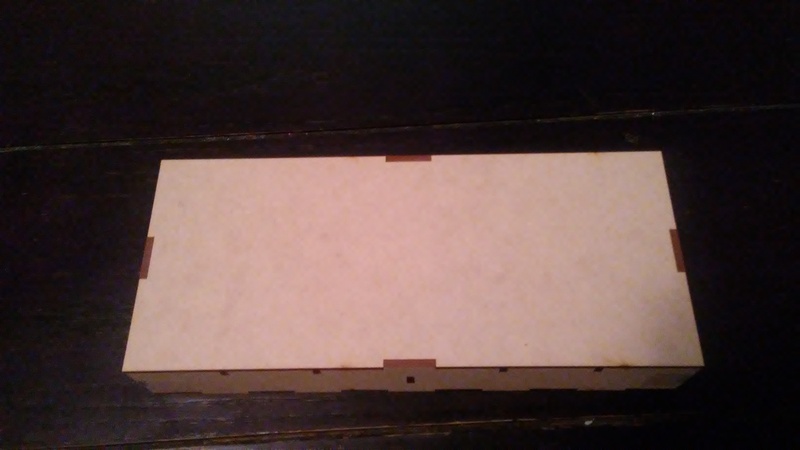 After you’re finished you can place a divider into the tray to keep things the right distance apart. I left these open to begin with as well. Later on you’ll see exactly how I placed everything. Once you’ve finished with one, you can build the other one the exact same way. When you’re finished, they should look something like this. 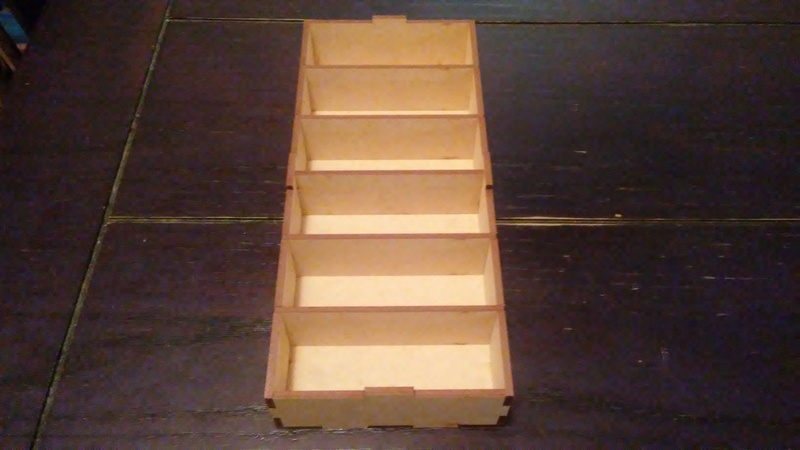 Finally, we’ll construct the small card storage tray. This one’s a little different. You’ll start by taking the inner base and attaching the long side wall to it. You’ll then do this for the other side too. Just be aware that there should be a space below the inner base if you sit it down on the table. You will then connect the short divider wall to the front of the inner base. Next you’ll connect the longer divider wall. This one has the word WOUND etched on it. You’ll see exactly how it looks in just a minute. You’ll then attach the lower base and connect it to the four walls. 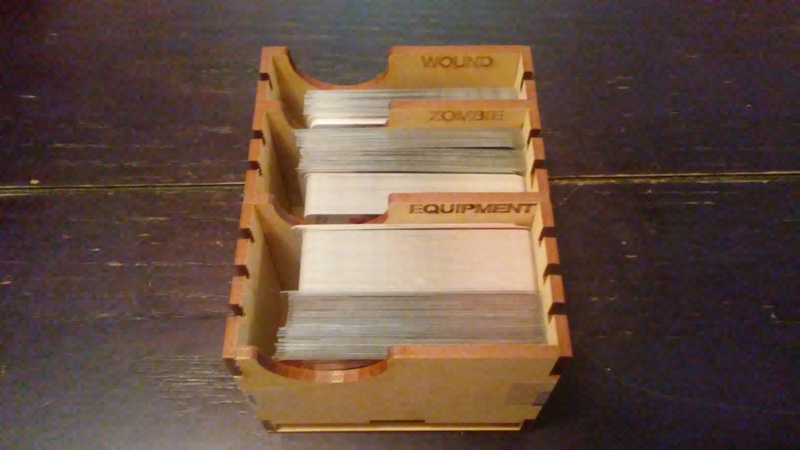 Afterwards you can place the corresponding dividers inside for Zombie and Equipment cards. When you’re finished it should look something like this. Now that you’re finished, you just need to wait for everything to dry overnight. 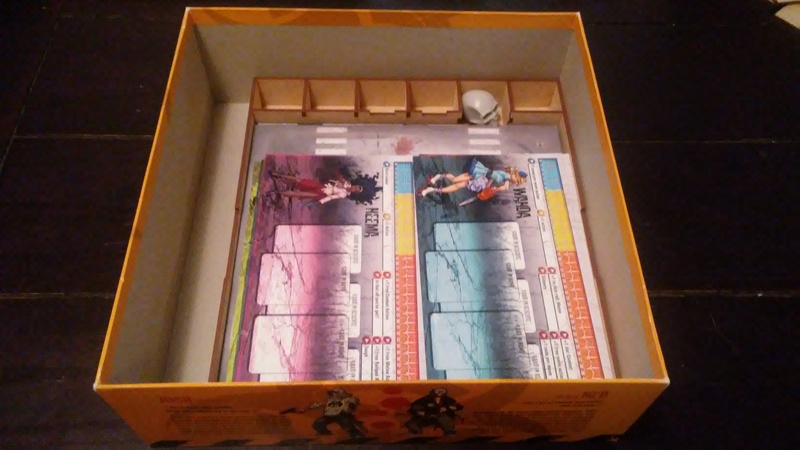 Once it has, you can place dividers as you see fit and place the different pieces and parts of the game inside the insert. As I mentioned earlier, I placed both the base Zombicide game and the Toxic City Mall expansion inside this, as well as extra Survivors, Zombivors and extra zombies. I then placed the etched tags as I saw fit into the different trays to identify what was in each one. Of course your setup may look a bit different compared to mine. I took a look at the pictures on the website and placed things where it made the best possible sense for what I have for the game, using the website as a guide. Here’s what I ended up with. At this point, I would normally explain how the different components of the game look. 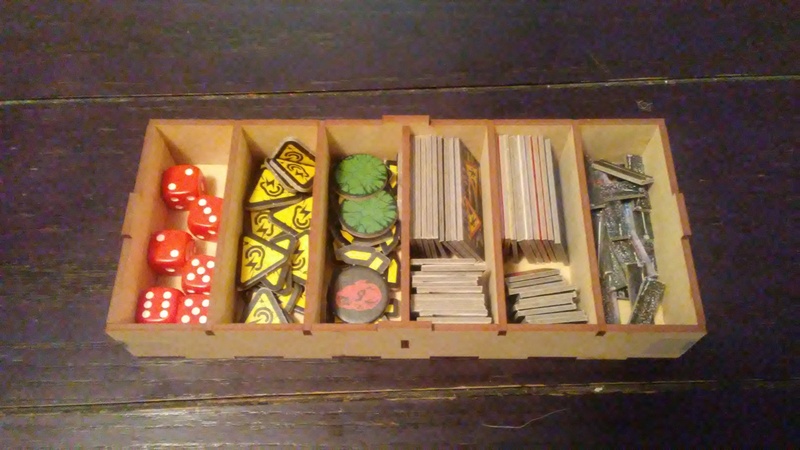 However since this is an organizer and not a game, I’ll describe the packing and insert instead. Everything came prepackaged in a flat rate shipping box. Everything was placed inside a large zip lock style bag with all the wooden pieces shrink wrapped together. Everything looked very nice and there were no problems with anything. The wooden sheets are nice and thick and are very easy to puch out the different pieces. If you decided to use glue or tape, you’ll need to supply your own as the organizer does not come with any included. Assembling the product was fairly simple, however it did take awhile to finish. Overall the materials look great and everything is strong and durable. I’m very pleased with every aspect of the materials. At this time, I would normally be explaining the rulebook of the game. Instead, I’ll cover the instructions that came with the insert. The instructions came on two sheets of double sided paper. There was a detailed process that walks you through each step of assembling the insert. There are plenty of pictures to help you see exactly what piece goes where when assembling. Everything is explained very well and I didn’t find it difficult to figure out at all. Everything is well written and looks good. I even like the joke at the end stating that I’ve now gained a +1 to my Dexterity and a +2 to my Crafting ability. Hilarious! Overall, I’m very pleased with the instructions and found them to be extremely helpful. For this section, I normally would be explaining how the game played and my thoughts and feelings on it. However since this is a product review, I’ll give my thoughts on the assembly process as well as anything that I feel is important to note. Putting the insert together took awhile to complete. There were lots of different trays and such that had to be assembled, as you can tell from the pictures above. I’ve mentioned this several times before but for those not familiar with Go7Gaming’s inserts, they tend to be a bit looser than normal inserts. It’s for that reason that I usually recommend glue or tape to hold everything together with, or both. Once I finished putting everything together I had to check the website to see what pieces went where. The instructions were a bit vague on that aspect of the process. Even with the pictures I was still a bit unsure. That’s why I simply went with what worked for me. Which is probably the best thing to do anyway. The pictures on the website did help and it got me pointed in the right direction anyway. I’ve mentioned several times that I included the Toxic City Mall expansion into this box. The only thing that I had problems with was finding a way to get the large rubble tokens into the box. It actually took me a bit but I finally went with just placing them on top of the rulebooks. I had also left out the large tiles from Toxic City Mall and had placed the survivor cards on top of the original game tiles. I have since went back and placed the large tiles together in the tray. It does lift the lid a little bit, but that’s fine. I now have the survivor ID cards on top of the insert below the rulebooks. Before there was no problem with the lid closing. It all fit down properly. Now there’s a little bit of lift on the lid, but not enough to matter. I’m actually fine with it. The box is quite a bit heavier with the inclusion of the insert. However it does make it a bit more structurally sound too. So there’s that benefit. I’ll say that the trays are great. They make things alot easier to get set up and a lot quicker too. 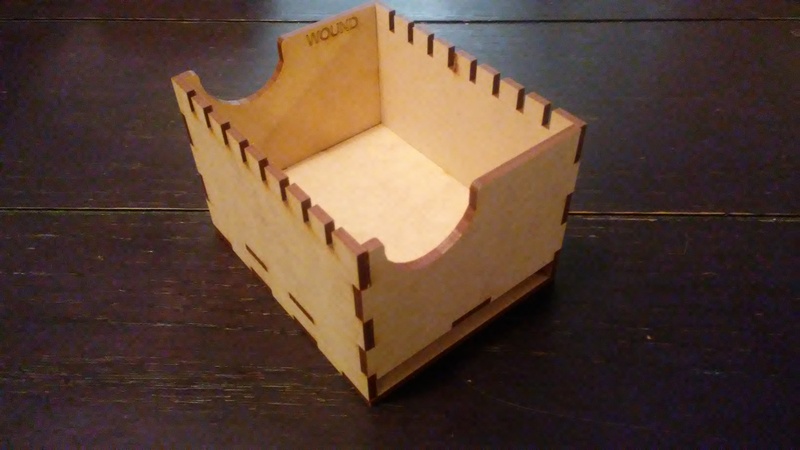 I was a bit concerned that I wouldn’t be able to get everything I had into this one box, but I did it and I’m happy with the results. I love the tags to tell whats in each tray too. Those are great. I placed all the zombies of like kind together and placed my survivors and zombivors in separate sections of the trays too. I had gotten some of the VIP zombies as well which I placed in the same tray as the Abominations since they were easy to tell apart. I just wanted to keep them separate so they wouldn’t get all mixed up with everything else. The cards are a bit tight with everything I have and I will most likely separate them a bit into one of the other trays, but for now it works. In any event, I’m very happy with the overall look and feel of the insert. It does a great job of keeping everything separated and yet together at the same time. I would highly recommend this to anyone that owns either the base game or the Rue Morgue version. 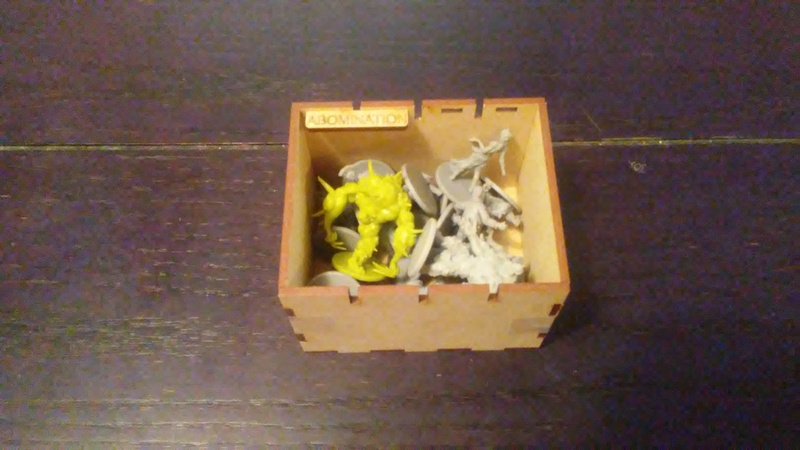 As you can tell, it’s got plenty of room to add other things to the box, so you don’t have to have separate boxes for everything. That’s a big bonus in my book. This is a great insert and I’m thankful that I have it. 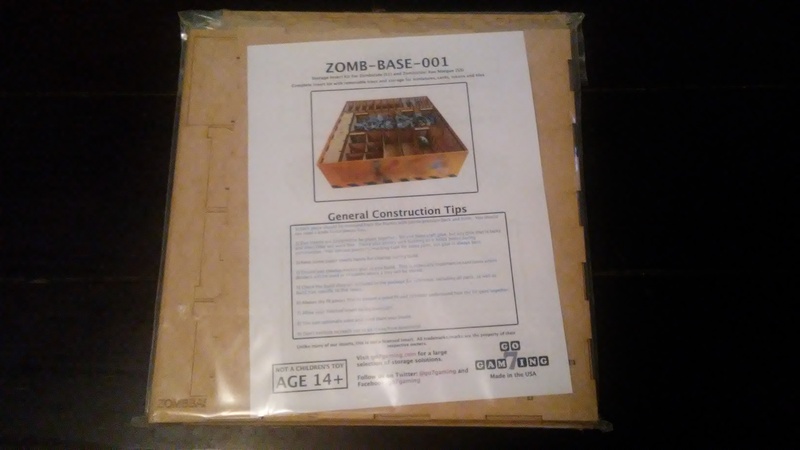 The Go7Gaming Zomb-Base-001 Storage Insert Kit for Zombicide or Zombicide Rue Morgue is a great way to get your game organized. 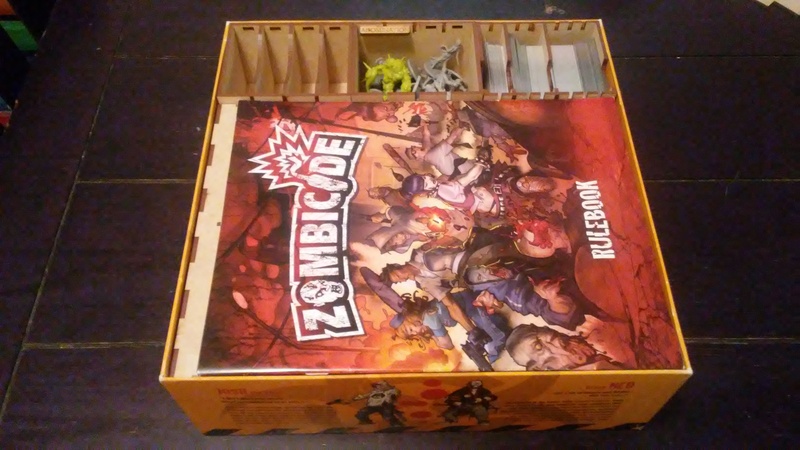 It has enough room for all the pieces of the base game or Rue Morgue, as well as adding one of the smaller expansions and extra zombies or survivors. Assembling everything was fairly easy. I didn’t have too many problems. It just took awhile to complete. The instructions are very thorough and are fairly simple to follow. 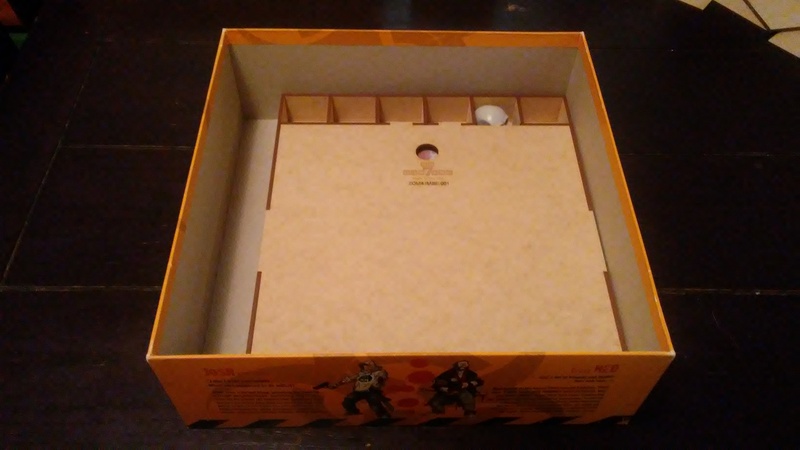 The insert is really great for keeping everything inside one box. It provides plenty of room for either game and for some extras too. 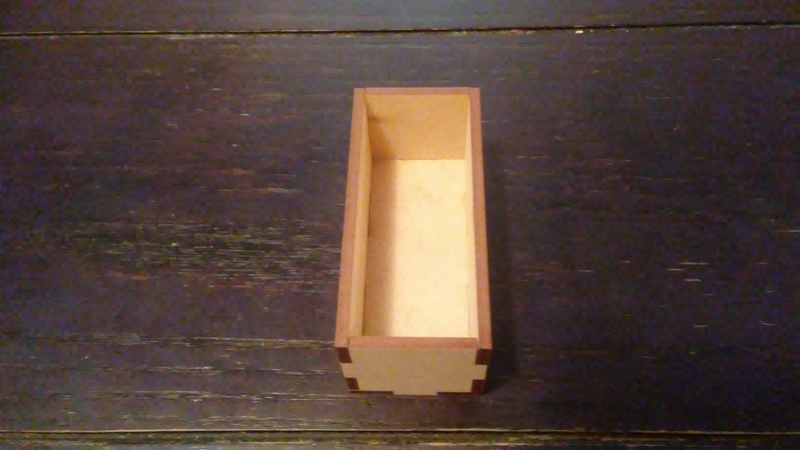 Overall I’m very happy with how nice it looks and how well it fits everything inside the box. I highly recommend this insert. It get’s the job done in style. It’s a definite improvement to my game. You’ll be happy with this and with the amazing service from the people at Go7Gaming. Guaranteed. 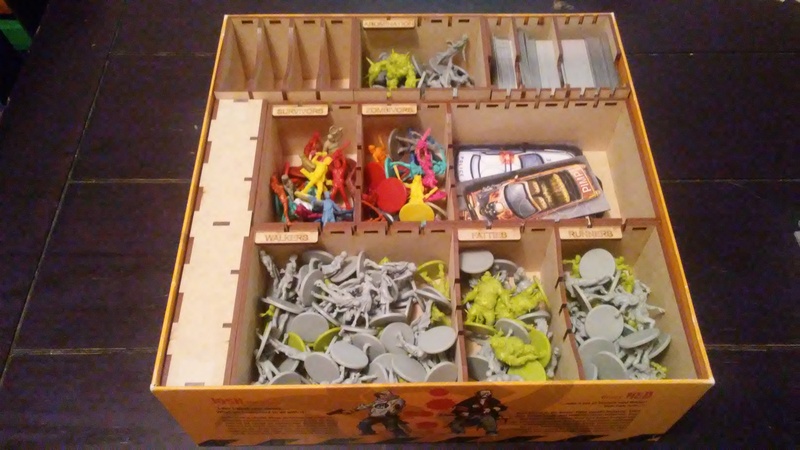 This entry was posted in Reviews and tagged 7, base, board, board games, card, card games, city, games, gaming, go, go7gaming, insert, insert kit, mall, morgue, organizer, rue, rue morgue, storage, storage solution, survivors, toxic, toxic city mall, zomb, zomb-base-001, zombicide, zombies, zombivors. Bookmark the permalink.